Organic Grass-fed Milk Is More Nutritious. It’s Science. Research reveals Organic Valley Grassmilk® is more nutritious. A new peer-reviewed study published in the Journal of Food Science and Nutrition reveals that Organic Valley Grassmilk® from 100% grass-fed cows has dramatically more omega-3 fatty acids than milk from cows that eat mostly grain. What does that mean? The more grass a cow eats, the more nutrient-rich the milk. When our cows eat well, so do you! Omega-3 are essential fatty acids that contribute to brain and eye health, especially in children. Organic Valley Grassmilk® gives you even more of the good stuff. When cows always eat grass and no grains, the grass-fed milk they produce provides more conjugated linoleic acid. In other studies, CLA is shown to have a variety of health benefits. The average American diet contains more omega-6 fatty acids than recommended, but Organic Valley Grassmilk® from grass-fed cows has a 1:1 ratio of omega-3 to omega-6. After more than 1,100 samples were analyzed, the science was in: whole milk from organic, 100% grass-fed cows has more omega-3, higher levels of CLA, and a better ratio of fatty acids. Omega-3 are essential fatty acids that contribute to brain and eye health, and in other studies CLA is shown to have a variety of health benefits. Most Americans consume a high ratio of omega-6 to omega-3, as high as 16:1, with excessive amounts of omega-6 fatty acids. This new scientific study shows that Organic Valley whole Grassmilk® has a better 1:1 ratio of omega-6 to omega-3. Our cooperative supplied the samples and funding through our Farmers Advocating for Organics (FAFO) grant program for this study. Read the rest of the details in the peer-reviewed study published in the Journal of Food Science and Nutrition. 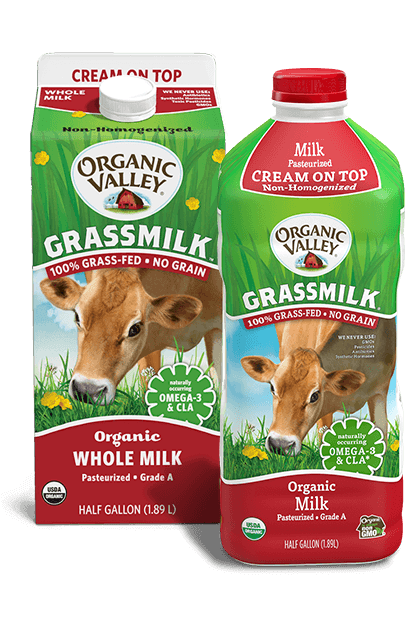 Find Organic Valley Grassmilk Milk at your local store. The Gretebecks, Organic Valley Grassmilk farmers, put soil quality and animal welfare first. Organic Valley Grassmilk farmers Brent and Regina Beidler prove that mission-driven agriculture works. Jon Bansen, an Organic Valley Grassmilk farmer, brings his experience to the world. The Holters saved their Organic Valley Grassmilk family farm by getting back to organic basics. The Donegans, Organic Valley Grassmilk farmers, find inspiration in western Vermont’s farming traditions.